Azure AD Domain Services managed domains include two built-in containers called 'AADDC Computers' and 'AADDC Users' respectively. The 'AADDC Computers' container has computer objects for all computers that are joined to the managed domain. The 'AADDC Users' container includes users and groups in the Azure AD tenant. Occasionally, it may be necessary to create service accounts on the managed domain to deploy workloads. 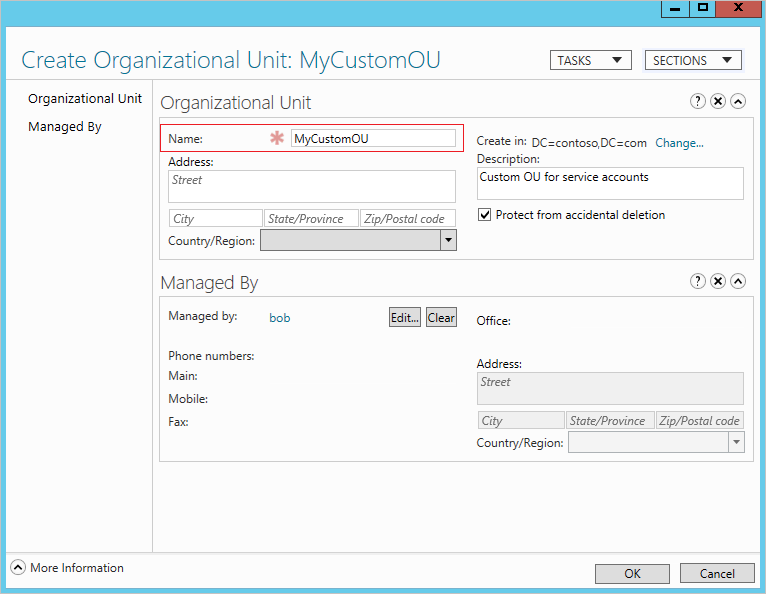 For this purpose, you can create a custom Organizational Unit (OU) on the managed domain and create service accounts within that OU. 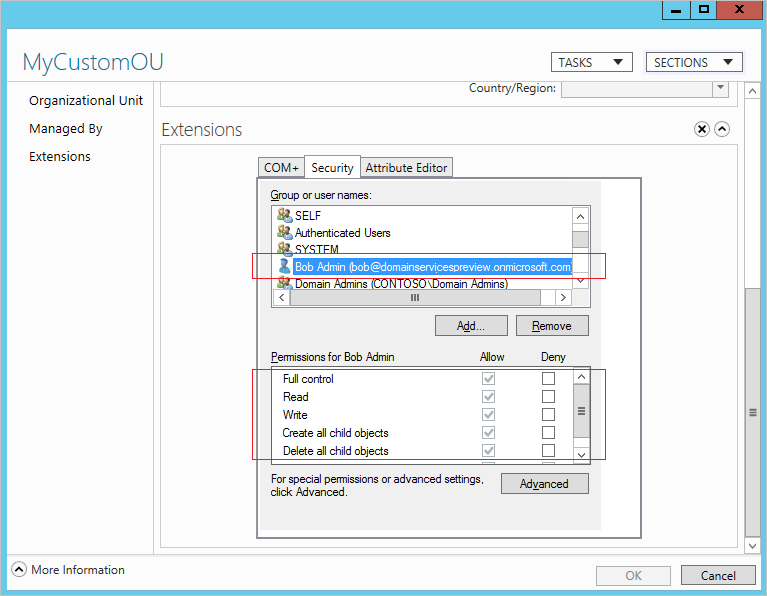 This article shows you how to create an OU in your managed domain. 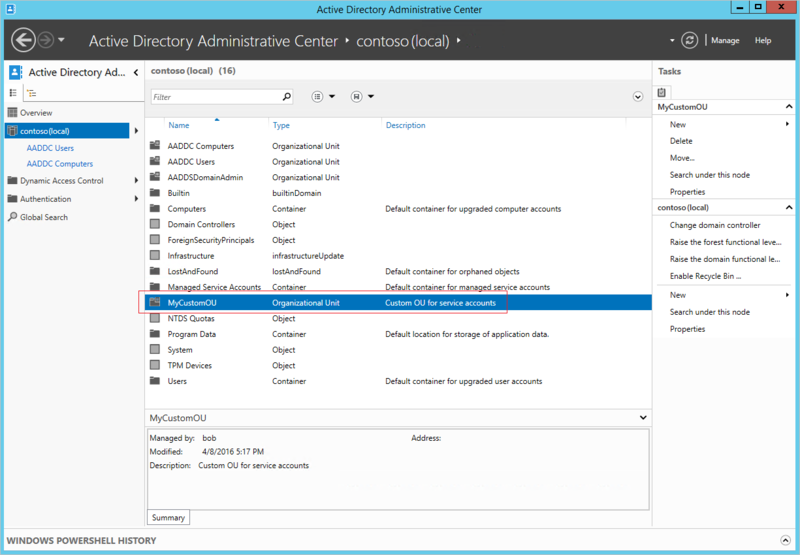 You need the credentials of a user account belonging to the 'AAD DC Administrators' group in your directory, to create a custom OU on your managed domain. 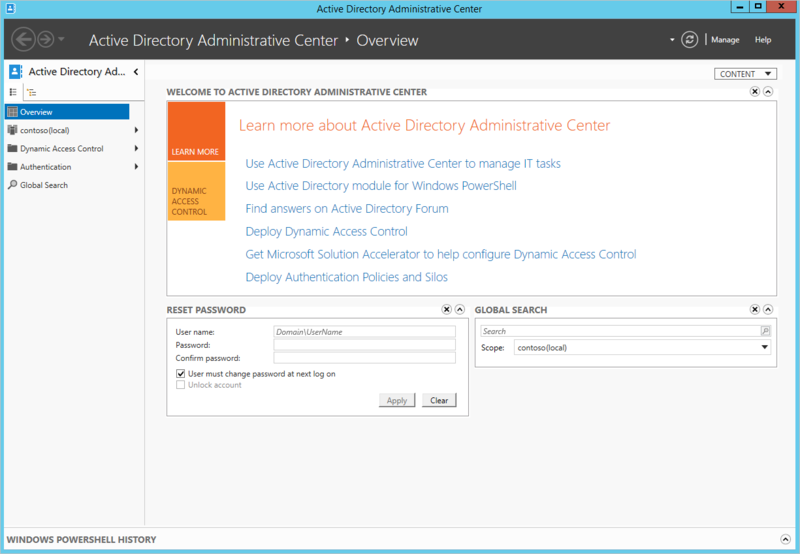 Azure AD Domain Services managed domains can be managed remotely using familiar Active Directory administrative tools such as the Active Directory Administrative Center (ADAC) or AD PowerShell. Tenant administrators do not have privileges to connect to domain controllers on the managed domain via Remote Desktop. 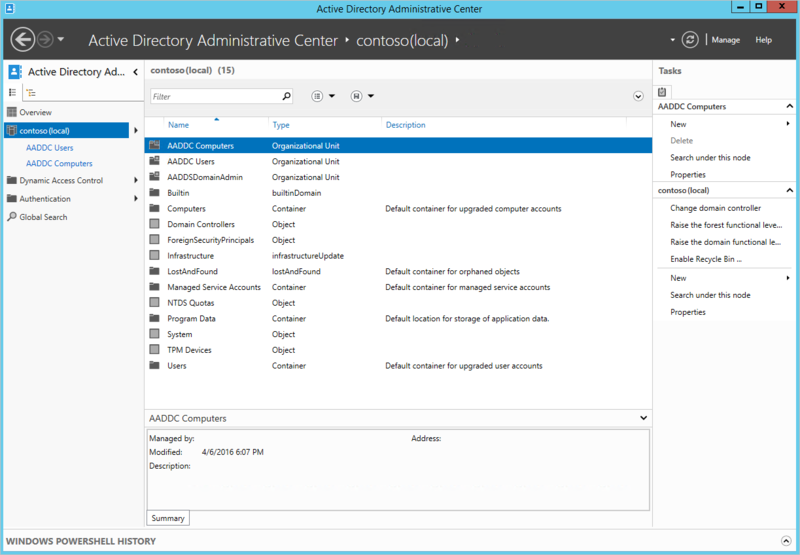 To administer the managed domain, install the AD administration tools feature on a virtual machine joined to the managed domain. Refer to the article titled administer an Azure AD Domain Services managed domain for instructions. Only members of the 'AAD DC Administrators' group have the required privileges to create a custom OU. Ensure that you perform the following steps as a user who belongs to this group. To view the domain, click the domain name in the left pane (for example, 'contoso100.com'). 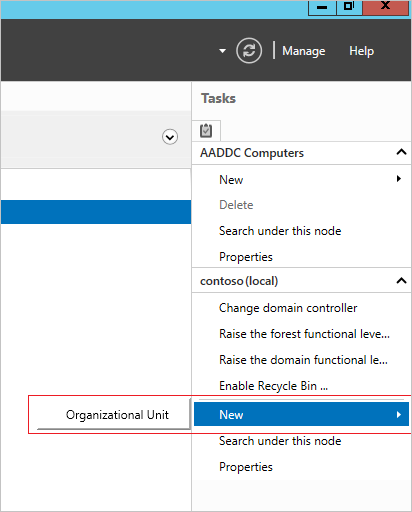 On the right side Tasks pane, click New under the domain name node. In this example, we click New under the 'contoso100(local)' node on the right side Tasks pane. You should see the option to create an Organizational Unit. Click Organizational Unit to launch the Create Organizational Unit dialog. In the Create Organizational Unit dialog, specify a Name for the new OU. Provide a short description for the OU. You may also set the Managed By field for the OU. To create the custom OU, click OK. The newly created OU should now appear in the AD Administrative Center (ADAC). By default, the user (member of the 'AAD DC Administrators' group) who created the custom OU is granted administrative privileges (full control) over the OU. The user can then go ahead and grant privileges to other users or to the 'AAD DC Administrators' group as desired. As seen in the following screenshot, the user 'bob@domainservicespreview.onmicrosoft.com' who created the new 'MyCustomOU' organizational unit is granted full control over it. Now that you have created a custom OU, you can go ahead and create users, groups, computers, and service accounts in this OU. You cannot move users or groups from the 'AADDC Users' OU to custom OUs. User accounts, groups, service accounts, and computer objects that you create under custom OUs are not available in your Azure AD tenant. In other words, these objects do not show up using the Azure AD Graph API or in the Azure AD UI. These objects are only available in your Azure AD Domain Services managed domain.